Everyone deserves a day at the beach, right? That’s why special needs individuals are encouraged to come out to a beautiful day at the beach with Moody Gardens and Texas Adaptive Aquatics to participate in free adaptive sports designed just for them. The 28th annual Adaptive Water Sports Festival will be Sept. 8 from 10 am to 4 pm at Moody Gardens Palm Beach. Weather permitting, all guests ages eight and up who have special needs will have the opportunity to water ski, sail, kayak and paddleboard with special equipment and instructors at no charge. The annual event gives individuals a chance to experience water sports. For some it’s the first time to experience any sort of sport of this kind, which makes it a very rare and unique opportunity. Individuals are also encouraged to bring their family along too to share the experience. Up to 4 immediate family members and caregivers are welcome to accompany guests who are participating and can enjoy free admission to Palm Beach. Extended family and friends can participate in the fun by purchasing a regular admission to Palm Beach, however only the lazy river and wave pool will be available to guests during this time. 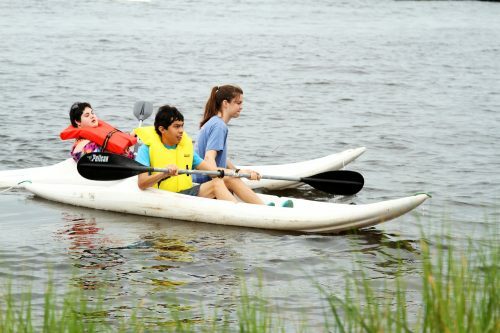 The event reaches hundreds of families each year with the generous help of adaptive equipment and instructors from Turning Point Gulf Coast, Galveston Community Sailing, Island Paddle, Sun Time Watersports and Texas Adaptive Aquatics as well as volunteers from around the community including UTMB. Registration for the event is required and will be open from Aug. 2 through Aug. 30. All activities are on a first-come, first-serve basis. The Adaptive Water Sports Festival is one of several Hope Therapy events held at Moody Gardens every year. For event RSVP or volunteer registration, please contact Moody Gardens at 409-683-4108 or email volunteers@moodygardens.org. The journey began 11 months ago for two harbor seals in peril named Tomato and Ravioli in Crescent City, California. They now have settled into a splendid forever home in Galveston, Texas at Moody Gardens Aquarium Pyramid. 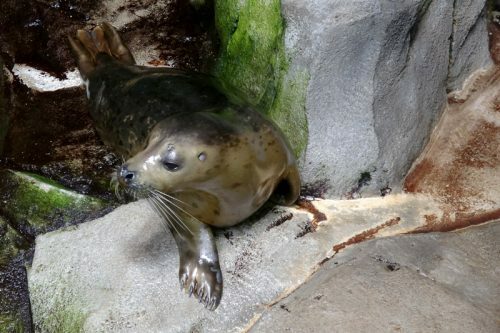 Both harbor seal pups were rescued and cared for last year by the Northcoast Marine Mammal Center in Crescent City. Due to health issues both pups were deemed non-releasable to the wild. Both arrived to Moody Gardens at the end of February and have made great progress since arriving. Tomato and Ravioli officially went on exhibit and made their public debut on July 11, 2018. Following their arrival both Tomato and Ravioli needed additional exercise and training to prepare for their exhibit. Originally upon release they would have hunted on their own, so the great people at the stranding center made sure they had some reserves to get by on until they started catching fish on their own. Since they have a new home at Moody Gardens there’s no need for that extra weight, so they have slimmed down to a healthier weight. “Now that they are both at normal weights for their age and species, we are able to take better care of them and provide for all of their needs,” said Maggie Reynolds, Moody Gardens biologist. 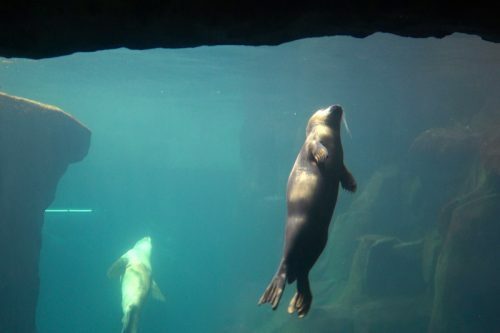 Both seals have had their share of personal health struggles. Tomato had severe injuries due to a suspected dog attack. His injuries healed, but did leave him blind in one eye. This attack led to Tomato not being able to forage for himself in the wild deeming him non-releasable. Ravioli suffers from a vestibular disorder causing her to suffer from neurologic and balance difficulties. She suffered from seizures as well. All of these problems made her unable to hunt successfully in the wild. Both seals have had an interesting journey, but it hasn’t slowed down their progress one bit since arriving. “Our focus is healthy, interactive animals who will build trusting relationships with us through positive reinforcement training and enrichment. Both are excited for their training sessions and are learning new things as fast as we can figure out how best to teach them,” said Allison Folsom, Moody Gardens biologist. Both Tomato and Ravioli are now on exhibit inside the Aquarium Pyramid and enjoying seeing guests who are anxious to meet them. 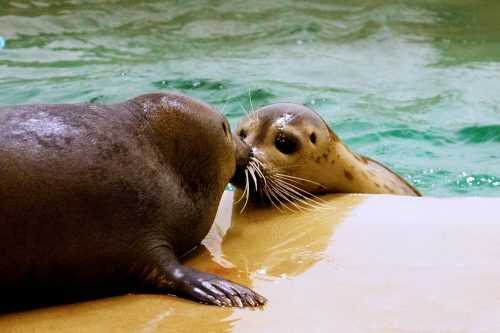 Fellow seals and sea lions at Moody Gardens have joined them in the exhibit to create one big happy family. Tomato and Ravioli are right at home at Moody Gardens, which is the perfect happy ending to their enduring and heartfelt journey. Guests can see Tomato and Ravioli in their new habitat at the Aquarium Pyramid daily, but also on the live seal cam at www.moodygardens.org/sealwebcam which is available 24 hours a day seven days a week. Historically the birding activity from about mid-May through early September is slow, hot, buggy and generally unrewarding. From a species diversity standpoint, this year’s activity follows the expected trend with only 6 new property species added since early May. With the Moody Gardens property total stuck on 185 and the golf course tally at 121, the past several weeks’ surveys have seemed pretty stagnant. On 12 July, I was able to add Whimbrel with one grazing through our northwest marsh area to end a 50 day stretch without a new species. As I enter daily surveys into eBird and check off boxes on the excel spreadsheet, I have to remind myself that encountering 25-30 species a day on a 240 acre property is actually pretty special. Researching more exotic birding locations in preparation for trips to South Texas and Colorado recently emphasized how lucky we are here at Moody Gardens. These summer observations have allowed me to focus more on what the species and individuals are doing in their day to day activities rather than simply looking to add to the overall species counts. Several species use various habitats here on our property to nest and raise their young. Late spring through early summer is the prime time for many of our resident species to bring up offspring. The large rookery of Yellow-crowned Night Herons and Green Herons in the oak trees around the Learning Place was very productive this year. At its peak there were at least 17 active YC Night Heron nests with between 2-3 chicks of varying ages being raised. The Green Herons seemed to stage their activity a little later than the YCNHs and I counted up to 11 of those active at one time. This morning’s survey only yielded one nest with 2 YCNH young that appear close to fledging. Several species nest in the retention ditch on the west side of the Aquarium. Although this location offers good cover and protection from predators, it is prone to flooding when we receive heavy summer rains. Despite the risks, there were at least 2 successful clutches of Black-necked Stilts and 3 successful Killdeer broods in that area this year. 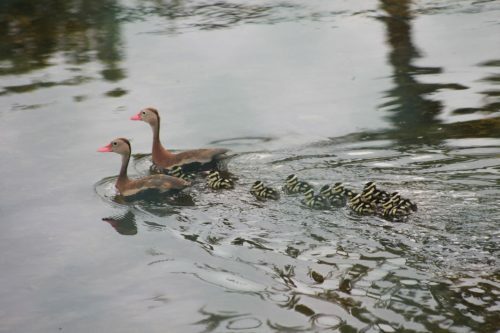 Yesterday morning I was surprised to see a brood of newly hatched Black-bellied Whistling Ducks in the dense southern half of the ditch. I counted 12 little “bumblebee” ducklings following closely behind their wary parents. Having large clutches is an evolutionary strategy designed to account for losses from predation. These cute little fuzz balls have some challenges ahead avoiding all the other hungry herons, egrets, gulls and even turtles looking for a quick meal. Even as we’re watching the tail end of breeding, we’re starting to see some of the early fall migrating species showing up again on their way south. Least, Semipalmated, Spotted and Solitary Sandpipers showed up on this week’s surveys. Yesterday there was a large flock of Orchard Orioles winging their way back across our Island for their winter “vacation”. It seems quite early for species to be moving back south, but it does add some excitement into the daily surveys. It also reminds me that creating a large data set like this year-long property survey will help answer bigger picture questions on climate change, and altered phenologies (plant and animal life cycles related to alterations in climatic patterns). Keep your eyes to the skies in anticipation of increasing numbers of birds flying over, or to our tropical Island paradise. Yesterday I found myself taking a deep breath. The spring migration seemingly came to an abrupt end as I flipped my calendar from April to May. The combination of southeast winds and calm weather purged our coastal habitat of all those colorful Passerines that took a brief rest stop here on our Island. Last night as I completed my eBird lists for the weekend and transcribed all the species tallies into the excel file I’ve been using to track sightings, the magnitude of what happened through the month of April was striking. I offer my sincerest apologies to my family, friends and colleagues that weren’t as obsessed with birds this past month as I clearly was. 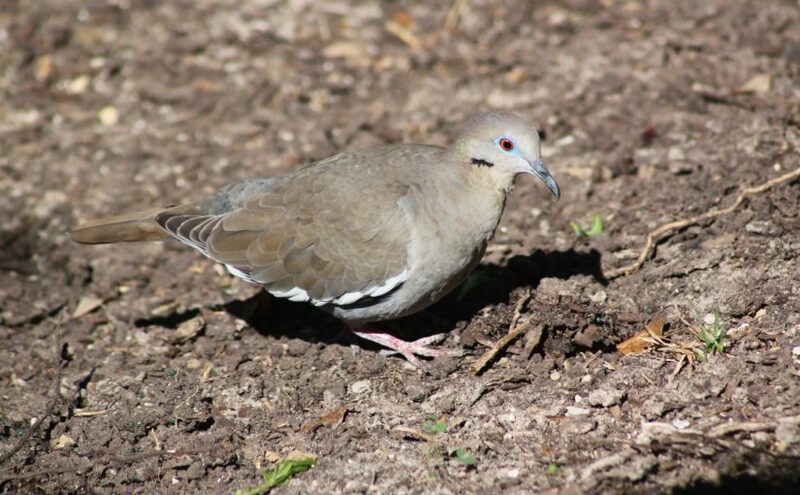 I realize looking at the number of species encountered, and moreover, the time spent looking for them, that April is by far the birdiest month of the year for us here in Galveston and for this project here on the Moody Gardens property and Golf Course. During April the property species list jumped from 111 to 179 and the Golf Course list saw a similar jump from 73 to 114. There continue to be 11 species seen at the Golf Course that were not encountered here on our main property, yielding an overall species total of 190 for this year-long project as we enter only the 5th month. There will continue to be spring migrants working through this area as we move through May and early June, but the main influx of birds moving north is mostly complete. I’ll be looking for a handful of shorebirds and perhaps another 2 or 3 Warblers over the next month. After that, the birds that can be seen from property should stabilize until we start to see the dribble of the fall migration moving more slowly through the area in late August or early September. Looking at the list of possibilities that might be tallied through the summer, I’d only anticipate adding perhaps another dozen species to the overall count before the cooler weather near the end of 2018. 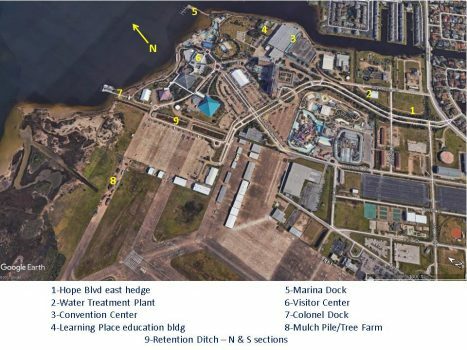 The property map above is a good depiction of the various habitats here on Moody Gardens that have been the best locations for seeing resident and migratory species. I’ve inserted numbers that loosely follow the order that I typically survey when I drive on property in the morning. In early April I started doing a slow drive down the east side of the hedge running down the east side of Hope Blvd. This area proved to be a great location to see a variety of the more cryptically patterned thrushes and small ground warblers using the shady cover as they foraged through leaves for insects. The water treatment plant is a good reference building with a large mulberry tree and cluster of bottlebrush plants in the east hedge along Hope Blvd. There is also a water slough that runs under Hope Blvd from Schlitterbahn and out to the Lake Madeline channel that borders our east side of property. Incidentally, I have been surveying this shoreline starting at the Jones Drive bridge in the top right corner of the map by driving out the gravel roads by Galveston Rentals and around the south fence line of the Municipal Sewage Plant. Locations 3 and 4 are the areas where I survey the Lake Madeline channel and old marina near the apartments to the northeast of Moody Gardens. The heavily vegetated areas around the west and north sides of the Learning Place education building proved to be excellent locations for the migratory birds as well as a nesting aggregation of Yellow-crowned Night Herons and Green Herons. The mulberry tree along the southeast corner of this complex as well as the bottlebrush in the south courtyard of the Learning Place were hotspots for warblers, tanagers and vireos while the low, dense shrubs to the west of the entry door were excellent places to look for thrushes, ovenbirds, waterthrushes and an elusive Swainson’s Warbler. The entire shoreline between the Marina Dock and Colonel Dock were viewable along the tram road running south of Palm Beach and north of the Visitor Center, Rainforest, Discovery Museum and large white tent. During the peak of the migration onslaught, I added a stop to look through the large oaks and shrubs on the south side of the Visitor Center with a few late migration additions showing up in that canopy area. The mulch pile, experimental tree farm and north marsh are a large area that didn’t receive as much attention as it probably should have. Access to these areas requires walking and the prairie and marsh habitat tends to be a bit soggy at times and harbors hungry mosquitos, so be forewarned that it’s not an easy stroll down sidewalks or tram trails like the other areas on property. Finally, the retention ditch on the west side of the Aquarium continues to be a great showcase for shorebirds and wading birds as well as a few warblers and buntings. This feature is primarily a freshwater runoff retention area with some saltwater influence from Aquarium operations. The sediment and nutrient inflows create a prolific vegetation community that then provides habitat (shelter) and a dynamic food web that attracts and supports the birds that seem to thrive in there. The Birds of Moody Gardens – Featherfest! The past 2 weeks have been a phenomenal celebration of spring migration. Since 10 April, the Moody Gardens property species count has risen from 139 to 173 with many of the new species coming in the form of colorful songbirds flitting amongst the trees and cryptically colored thrushes rummaging amongst the dark undergrowth. I’m finding now that I’m running out of new species to look for with the list of likely additions dwindling. 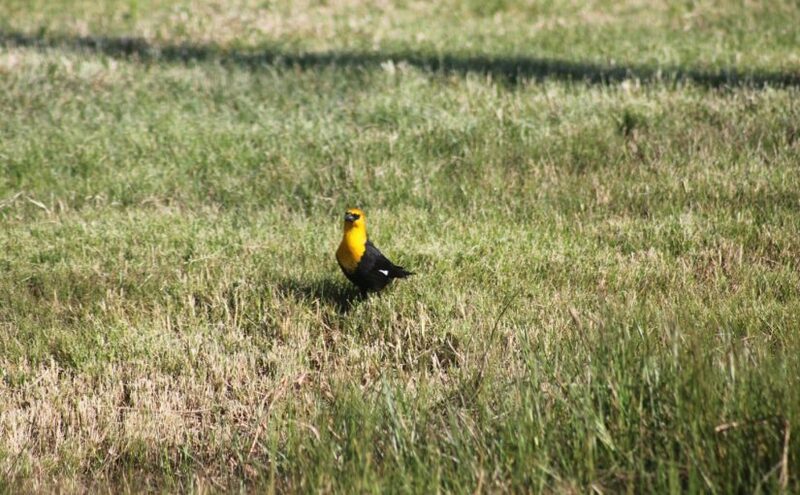 One species that I would not have anticipated adding on this year-long survey is the Yellow-headed Blackbird pictured above. Thanks to Megan Foshee in Education for noticing this brightly colored specimen and passing the info along quickly so I could hunt it down and get some great pictures. This is a western species that rarely makes an appearance out here on Galveston Island. Photographically capturing a handsome male specimen here on property is certainly a lucky event. This past week was the 17th annual Featherfest hosted by Galveston Island Nature Tourism Council (GINTC). This official “migration celebration” has grown from a simple local affair into one of the premier birding and photography festivals attracting 600+ participants from all over the United States and beyond. Through the 6 days of organized activities, there were over 240 species seen or heard, making this year one of the best on record. I had the great pleasure of hosting Greg Miller at my house again this year. If you’re familiar with the movie and book named “The Big Year”, Greg is one of the three primary characters (played by Jack Black in the film). I was able to bird with him a few times this year and thoroughly enjoyed soaking up all his helpful hints on bird identification and behavior. Casting Jack Black to play Greg was brilliant as he’s just one of the most genuine, positive people I’ve met. Greg told me that this past Sunday was the second best Texas warbler day he’d ever had, with the first being his “Big Year” day 20 years ago at High Island. That’s pretty great praise for Galveston Island’s habitat as we only visited 3 places on the Island, and Lafitte’s Cove Nature Preserve wasn’t even one of them. Greg will be back again next year to lead trips, so I’d advise anyone that’ interested in a fun field trip to sign up early. The list of new species encountered since the 10 April blog includes: Blue-winged Teal, Least Bittern, Purple Gallinule, Semipalmated Plover, Upland Sandpiper, Baird’s Sandpiper, Yellow-billed Cuckoo, Eastern Wood Peewee, Great-crested Flycatcher, Blue-headed Vireo, Warbling Vireo, Philadelphia Vireo, American Crow, Veery, Gray-cheeked Thrush, Swainson’s Thrush, Gray Catbird, Brown Thrasher, Tennessee Warbler, Yellow Warbler, Chestnut-sided Warbler, Black-throated Green Warbler, Blackburnian Warbler, Yellow-throated Warbler, American Redstart, Swainson’s Warbler, Ovenbird, Northern Waterthrush, Yellow-breasted Chat, Scarlet Tanager, Rose-breasted Grosbeak, Baltimore Oriole, Dickcissel, and Yellow-headed Blackbird. There are still a lot of spring migrants moving through our area and we’ll see a few new species coming through in the next 3-4 weeks. Please don’t hesitate to contact me directly if you have questions on where to go on property, or in the general Galveston area for birding. Posted on April 24, 2018 May 4, 2018 Author Moody GardensCategories UncategorizedLeave a comment on The Birds of Moody Gardens – Featherfest! The Birds of Moody Gardens – Fallout! During the spring migration here on the Gulf coast, there is a phenomenon known as a fallout. If you’re a birdwatcher and you find yourself along the Texas coast in April, you keep your eyes to the sky and watch the weather forecasts. If you are lucky (and the birds are not), a fast moving frontal boundary moves south at the exact time that flocks of migrating songbirds are winging there way north across the vast open water expanse of the Gulf of Mexico. Under perfect circumstances these dainty warblers, vireos, buntings and orioles catch favorable winds and make the 500 mile flight from the Yucatan Peninsula to our coast in about 18 hours and have ample energy to find shelter, food and water someplace on the coastal plain. If however, they make that commitment and leave the sight of land to our south and then run into strong head winds, the crossing quickly turns into a life and death struggle with many not making it to the northern shoreline. Those that do arrive are completely depleted of energy and collapse in exhaustion in the nearest safe cover they can find. This is called a fallout as the birds will literally drop from thousands of feet in the air over the first piece of solid ground they encounter. If you’ve been outside on property over the last couple of days, you most probably have noticed a LOT of small, colorful, chirping birds moving around in the trees and shrubs all across the project. The combination of the strong cold front that arrived overnight Saturday and the continued northeast winds through Sunday have stopped thousands of birds here on the Island. They are resting and foraging for any quick nutrition and energy they can get including bugs, berries and seeds. The diversity of species through the entire spring migration is truly amazing, but when you see it suddenly over the course of a few days it’s exhilarating. 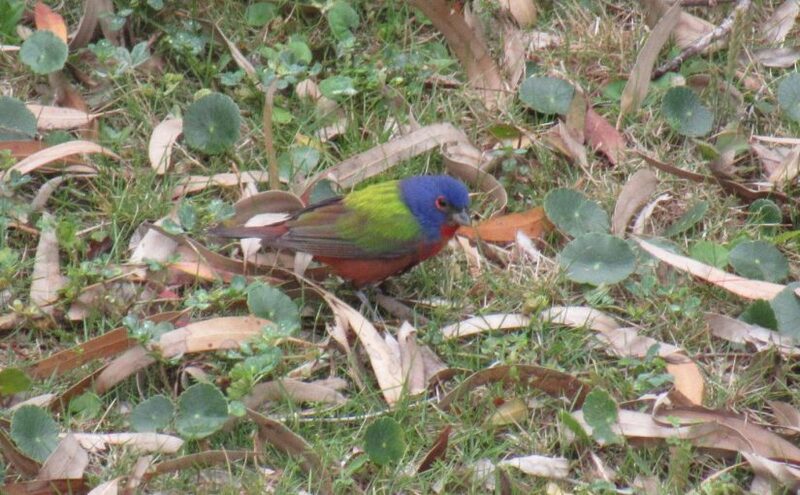 The very colorful bird pictured above is a male Painted Bunting. These guys look like something imagined by a creative child and the super-deluxe Crayola box. Often in mixed flocks with their equally brilliant cousins, the Indigo Bunting, they work along hedges and the edges of wooded lots picking seeds and insects from the leaves and grass. Normally the males of these migrating birds will move north first to stake out prime nesting habitat and await the arrival of the females. It’s critical that they wing quickly north to find the perfect balance of food, water and shelter and defend those resources. In the first 9 days of April, the property species count jumped from 112 to 139 with 17 new species in the last 4 days alone. The species additions listed in order of sighting are; Semipalmated Sandpiper, Short-billed Dowitcher, Chimney Swift, Eastern Kingbird, Cliff Swallow, Red-winged Blackbird, Common Moorhen, Gull-billed Tern, Common Grackle, Orchard Oriole, Ruby-throated Hummingbird, Summer Tanager, Indigo Bunting, Painted Bunting, Blue Grosbeak, Worm-eating Warbler, Hooded Warbler, Nashville Warbler, White-eyed Vireo, Prothonotary Warbler, Northern Parula, Wood Thrush, Kentucky Warbler, Red-eyed Vireo, Blue-winged Warbler and Least Flycatcher. As favorable weather conditions return and these birds refuel, they will be moving on to the north towards their nesting grounds. The spring migration will continue through the next 4-6 weeks, so there should be a continual rotation of individuals and species moving through our area. If you get a chance to get out on property over the next few days, please take advantage of this rare spring fallout. The number of individuals and diversity of species isn’t something to take for granted as this type of event is something that occurs every few years when the exact conditions coincide. This morning as I walked in to work I was distracted by hundreds of individuals of dozens of species flitting amongst the foliage. I was reminded that just as these lovely songbirds make their way north following the food resources; they bring with them a cadre of Avian predators that reap the bounty of this moving buffet. I was just framing a picture of a nice male Painted Bunting just like the one pictured above when an American Kestrel whizzed past and scooped him up for breakfast. As the saying goes “a bird’s gotta eat”. I saw a Merlin yesterday hunting around the north marsh near the tree farm terrorizing a similar group of Buntings. The falcon species are specialists at hunting fast moving prey, especially birds. Posted on April 12, 2018 April 13, 2018 Author Moody GardensCategories BirdingLeave a comment on The Birds of Moody Gardens – Fallout! Guests will learn more about their planet, and come away with a better understanding of what everyone can do to better protect it, at “One Earth, One Choice,” set for April 21 at Moody Gardens. Guests can immerse themselves in the spectacular wonders of both the Rainforest and Aquarium Pyramids. Witness a breathtaking tribute to the wonders of Asia, Africa and the Americas as well as the Gulf of Mexico, South Atlantic, South Pacific, North Pacific and the Caribbean that showcases some of the issues that are having a negative impact on these environments. Earth Day weekend kicks off April 20 in conjunction with Galveston’s Featherfest activities and an Audubon Society presentation in the MG 3D Theater and a showing of “The Lost Bird Project.” This film features artist Todd McGrain’s creation of bronze sculptures of five extinct bird species and his mission to install the pieces where the bids were last seen in the wild, including the Eskimo Kurlu last seen on 11 Mile Road in Galveston. Start off Saturday with a free yoga class at 8 a.m. in the Butterfly Garden. Need something for the kids to do while you are getting your exercise in? “The Lorax” will be showing starting at 8 a.m. in the 4D Special FX Theater. “Amazon Adventure 3D” will also be showing at various times throughout the day in the MG 3D Theater. For those who are interested in taking action with earth-conscious efforts, Moody Gardens invites you to join staff and volunteers at 9:30 a.m. for a wetlands cleanup along Offats Bayou. The group will depart from the Tram Stop located in the West Parking Lot. Earth Day events are planned for 10 a.m.-3 p.m. across the Moody Gardens property. The Moody Gardens “ZOOpermart” will be open inside the Rainforest Pyramid allowing guests to learn about palm oil and how environmentally friendly their food is. Craft tables will also be set up in the Visitor’s Center Lobby where guests can make Toad Abodes out of flower pots. Check out the Earth Day Expo in the Garden Lobby and discover more about gardens, Master Naturalists, Master Gardeners, diving and the Turtle Island Restoration Network. Visit the Macadamia Room at 11 a.m. and 1 p.m. to see a presentation from the Moody Gardens’ Education Department about the different plants and animals of the Rainforest and how human interaction affects those species. Feast on sustainably-sourced options in The Garden Restaurant. Choose from grilled Keta Salmon over white wine cream sauce pasta and vegetables with garlic bread or Salmon tacos with Citrus Slaw on corn tortillas served with rice pilaf and salsa verde. Moody Gardens’ biologists will host Keeper Chats throughout the day highlighting a variety of animals including birds, komodo dragons and more. Staff will lead discussions on important environmental issues as visitors can learn how to better protect the planet for the future. Milkweed will also be given away to guests throughout the day while supplies last. “Education and conservation are vitally important aspects of our mission here at Moody Gardens. These events bring awareness to what we can do to make this a better planet, not only for us, but for the animals and plants we share it with,” Moody Gardens President and CEO John Zendt said. Moody Gardens will offer an Earth Day Special Value Pass for $59.95 for adults and $49.95 for seniors and children ages 4-12 on April 21. This pass will be available for purchase both online and at the ticket counter for admission to all Moody Gardens attractions. For a complete event schedule, click here. Galveston Island is teeming with birds as those that wintered here prepare to fly north and we get ready for the spring migration season. If you are curious about the many different types of winged creatures you have seen inhabiting our island over the last few months, birding might be just the hobby for you. Here a few basic tips to get you started. Invest in a good pair of binoculars. You want to make sure that are getting bright and crisp pictures through your lenses. Pick up a field guide so that you can identify what species you are finding in your excursions. If you want the birds to come to you, invest in a bird feeder. Have your camera handy. The pictures you take can help you identify a bird, and have beautiful images to enjoy for years to come. Get connected with your local birding club to find out about future bird outings. Birds of Moody Gardens – Goodbye Winter, finally! The birding trip this past Saturday morning (24 February) was a welcome break from the foggy, drizzly, cold, windy weather we’ve experienced through February. After the two brutal cold snaps that severely challenged our tropical landscape, Islanders have been hacking down dead foliage, clearing beds and beginning the process of replanting. As each of you reimagines your personal surroundings, I’d encourage you to consider thinking of resident and migratory birds in your master planning process. Houston Audubon Society offers great suggestions in their Creating Bird Friendly Communities section of their website. Planting native species of grasses, plants, shrubs and trees creates habitat and supports the naturally occurring food webs that benefit wildlife. Adding a clean water source like a bird bath, fountain or drip adds serenity to your environment and benefits wildlife. Reducing risks such as reflective window situations, bright artificial lighting at night and pets that act as predators when birds are at their most vulnerable after making the 500 mile flight across the Gulf of Mexico can save countless migratory bird lives. Where birds thrive, people thrive. We’re seeing some of our winter visitors winging off to the north to start their courtship, breeding and nesting activities and they’ll be replaced by spring migrants that have been spending the winter farther south. 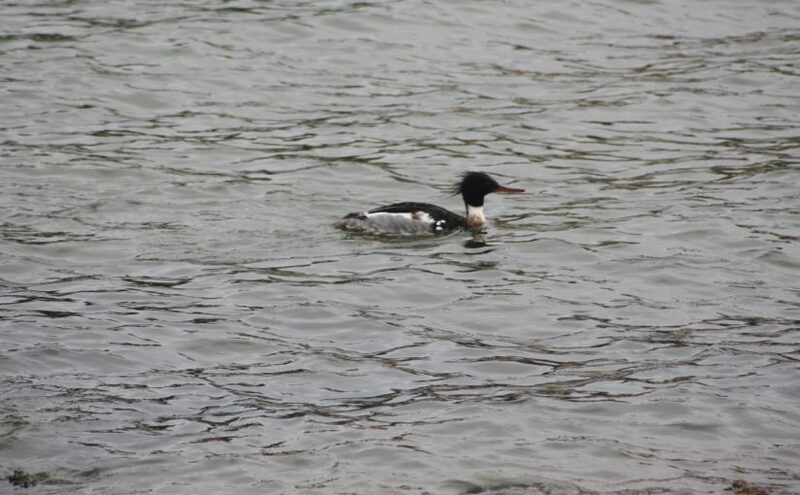 Waterfowl species like the Red-breasted Merganser pictured above are leaving our coastline in large flocks. This lone male was patrolling the Lake Madeline channel on the east side of the Learning Place this morning. Just last week I counted more than 75 of them in a flock in Offatts Bayou beginning to raft up prior to flying off to Northern Canada or Alaska to start their 2018 families. Over the next few weeks we’ll see most of our winter waterfowl, raptors and sparrows disappear with shorebirds, swallows and early songbird migrants flying up the coastline from the west to replace them. Many of the species we’ll see between now and mid-May will continue past Galveston to points farther north and east as their summer homes. The buzz of spring migration is building. Every day I drive or walk the property I’m on the lookout for new species to check off a list or photograph. Many of those that will be flying through may only stay for a day or two, so I’m keeping my eyes to the skies so I don’t miss any. Through late February I’ve logged 87 species of birds either using Moody Gardens’ habitats, or flying over. There were another 7 unique species that were seen while surveying the Golf Course for a total of 94 species to include in the Birds of Moody Gardens project. The new species encountered in February include Pacific Loon, White-tailed Kite, Bonaparte’s Gull, Horned Lark, Purple Martin, Tree Swallow, Cedar Waxwing, Seaside Sparrow and Vesper Sparrow. I also discovered and joined the world of eBird. It’s an online resource that Cornell Ornithology Lab established to help collect a huge amount of bird population data by providing an easy to use bird checklist app for phones and computers. Moody Gardens is listed as a hotspot, so the species accounts that are entered are viewable by anyone that uses eBird. Get out and enjoy spring’s arrival and look out for birds literally and figuratively as you improve your post-winter backyard habitat. Posted on March 4, 2018 February 27, 2018 Author Moody GardensCategories UncategorizedLeave a comment on Birds of Moody Gardens – Goodbye Winter, finally!